I found this old wooden spice rack at the St. Louis Park Goodwill Store on Black Friday last year. Everything was 50% off that day. It is sooooo cold here this week. (50 below with wind chills) Schools are closed, the post office is closed, and even the county court house is closed. I am concentrating on all smaller projects so I don't have to visit my shed or garage. 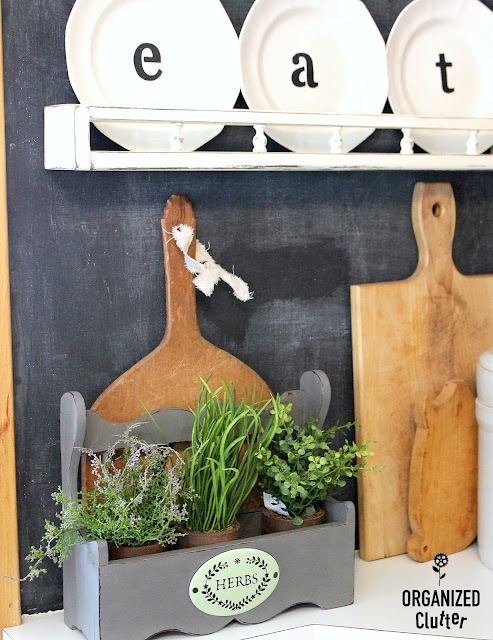 After washing down the wooden spice rack with hot, soapy, Dawn Dish Soap water, I brushed on two coats of Dixie Belle Chalk Finish Paint in Hurricane Gray . No priming or sanding were necessary with Dixie Belle Paint, and the paint is self sealing. Clear coat and Gator Hide add extra durability to the paint, and the waxes give the paint a very rich appearance. After my paint was dry, I gave the gray spice rack an all over sanding, with more pressure applied to distressing on the edges. I used 220 grit sandpaper. After sanding, I wiped the rack down to remove the paint dust, and then applied Dixie Belle Best Dang Wax in Clear using Intex Pfc Precision-fiber Paint & Cleaning Rag . The wax is water based. I used one fiber rag to apply the wax and one to wipe it down when the wax has dried. 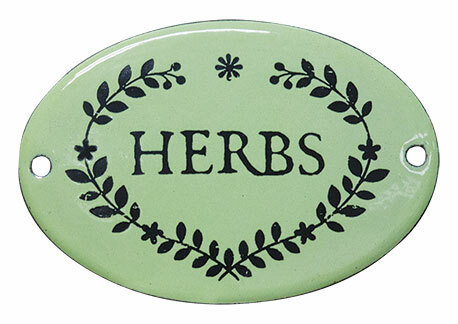 I have had this little enamelware sign from KP Creek Gifts for several years. Maybe you remember it on this pallet shelf on the covered patio, one summer. 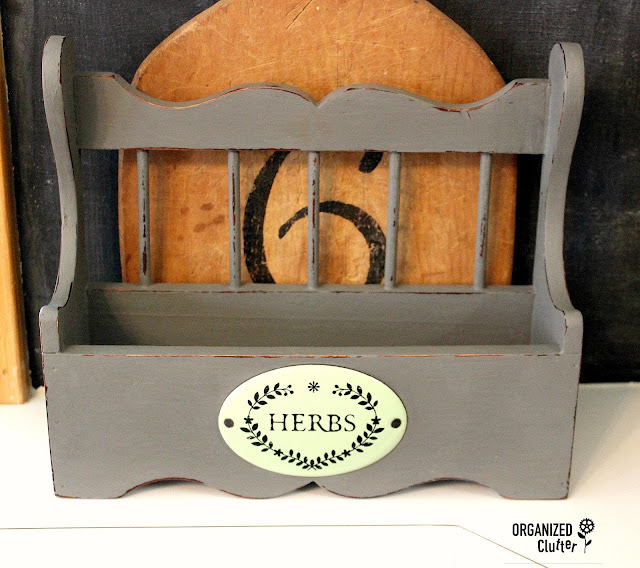 Last summer I changed up the pallet shelf, so the herb sign was available for use on a new project. Carpet tacks were used to attach the sign. This little rack can hang on the wall OR sit on a shelf or counter. Near a window, or on a window sill if you wanted real potted herb plants. 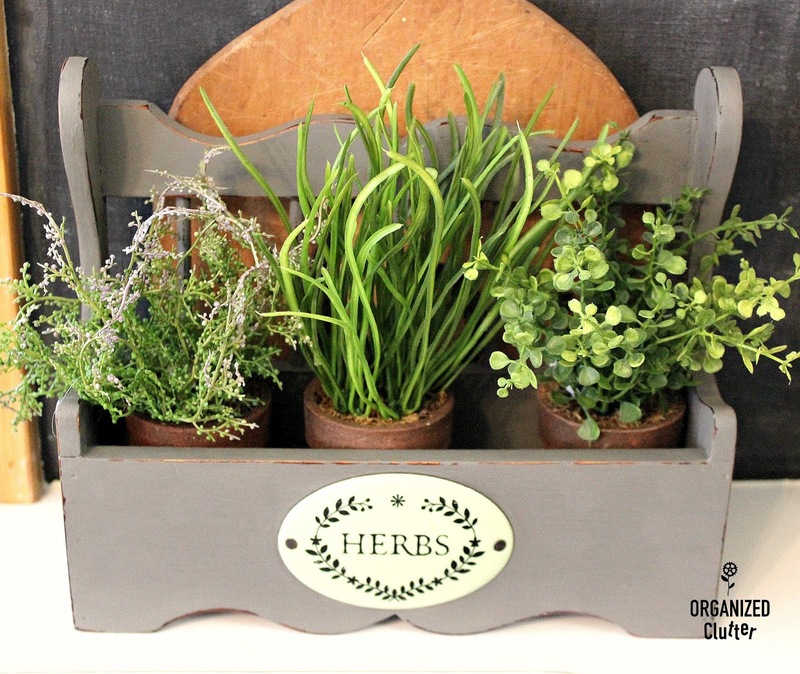 I have three little antiqued terracotta look pots with faux herb looking plants made by Sullivan Floral and Gifts. I purchased them at a local drug store. Any little faux potted herbs or vases with faux herbs would work. 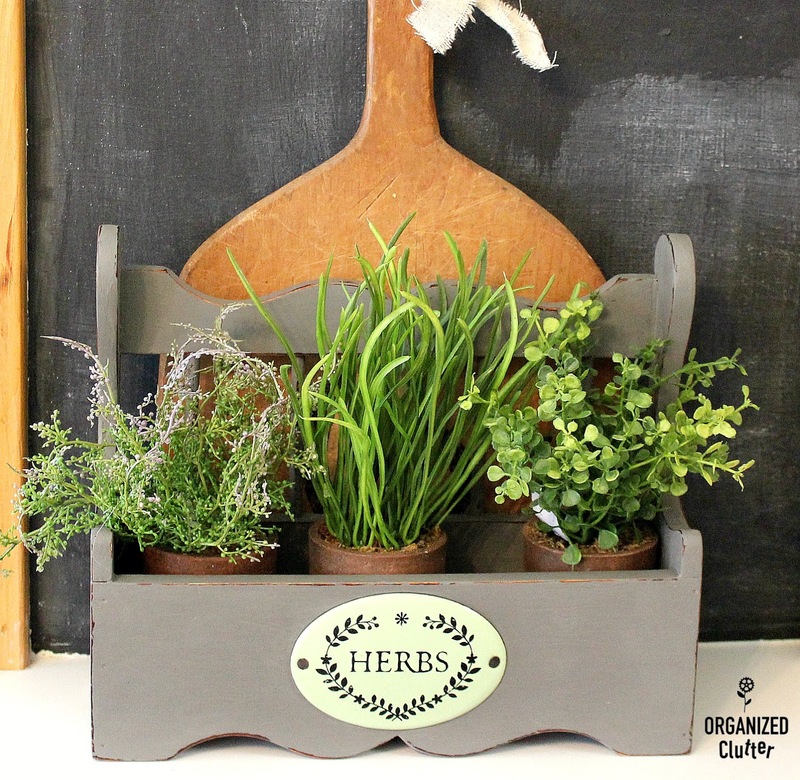 You could also add a flower sign or stencil and display faux potted flowers in the spice rack. 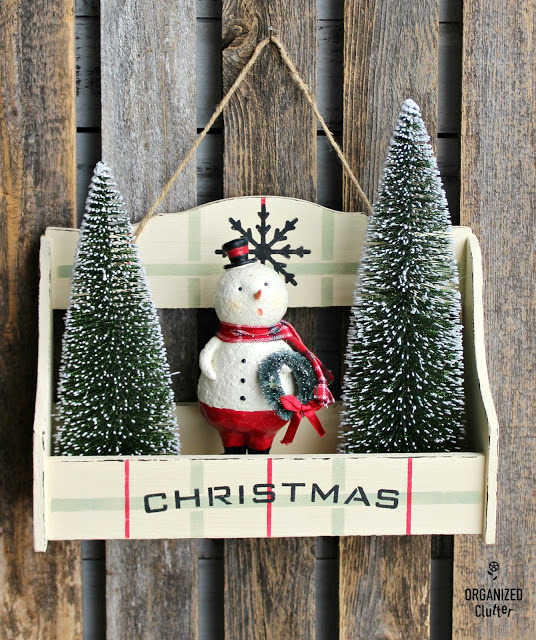 Pick up two spice racks at the thrift shop and make the other one into Christmas decor! I love how you did the Christmas spice rack. Did you do a tutorial for it? 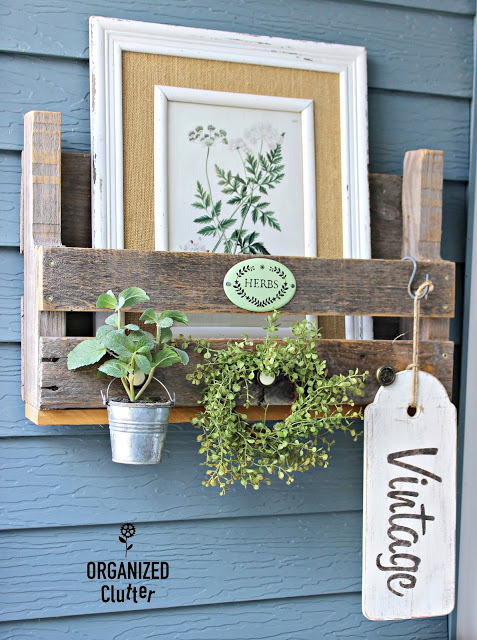 Beautiful upcycle! 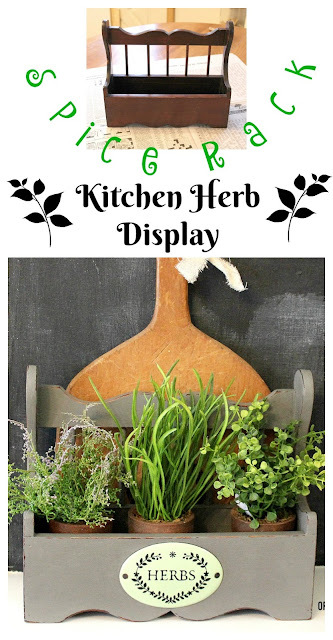 Love how you display it with the cutting board and plants.